The Women’s Caucus for Art announces the 2019 Lifetime Achievement Honorees and plans for the Celebration on February 16, 2019 in New York, NY. 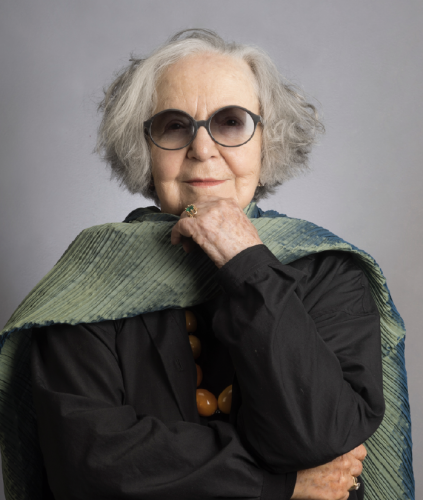 The Women’s Caucus for Art (WCA) is pleased to announce the recipients for the 2019 WCA Lifetime Achievement (LTA) Awards: Olga de Amaral, Mary Beth Edelson, Gladys Barker Grauer, and Mira Schor. The recipients for the 2019 President's Art & Activism Award are L.J. Roberts and Aruna D'Souza. The WCA Lifetime Achievement Awards were first presented in 1979 in President Jimmy Carter’s Oval Office to Isabel Bishop, Selma Burke, Alice Neel, Louise Nevelson, and Georgia O'Keeffe. The Awards were the first awards recognizing the contribution of women to the arts and their profound effect on society. Today, the Lifetime Achievement Awards continue to honor women, their work, their vision, and their commitment. Recent honorees have represented the full range of distinguished achievement in the visual arts professions from Charlene Teters to Kiki Smith to Carolee Schneemann to Renee Stout. For more information on past honorees visit: https://www.nationalwca.org/awards/pasthonorees.php This year’s honorees are no exception, with considerable accomplishment, achievement, and contributions to the visual arts represented by their professional efforts. New York. Galleries and institutions worldwide have exhibited Amaral’s work, the full range of which is represented in the collections of over forty museums, including the Musée d’Art Moderne de la Ville de Paris, the Museum of Modern Art, New York, the Museum of Modern Art, Kyoto, Japan, San Francisco’s De Young Museum, and the Museum Bellerive in Zürich. Amaral currently lives and works in Bogotá, Colombia. 50 years she has created iconic artworks – ranging from photography, painting, sculpture and drawing to performance, book/print making, collages and murals – often using her own body as canvas and subject matter. Edelson was a founder of Heresies Magazine and a formative early member of A.I.R. Gallery, the first all-women’s gallery in the United State which opened in 1972. Edelson was the subject of a celebrated retrospective mounted by Malmö Kunstmuseum, Sweden, which traveled to Migros Museum, Zurich (2006), as well as the traveling retrospective Shape Shifter: the Art of Mary Beth Edelson (1988-1990). Edelson has had numerous solo shows internationally and was included in important survey exhibitions including Painting 2.0, Museum Brandhorst, Munich; WACK! Art of the Feminist Revolution, MOCA, Los Angeles; Pictures by Women: A History of Modern Photography, MoMA; Mothers of Invention, Mumok Museum of Contemporary Art, Vienna; and most recently, Feminist Avant-Garde of the 1970s: Works from the Verbund Collection, the Photographers' Gallery, London. Edelson’s work is included in the permanent collections of the Museum of Modern Art, NY; Tate Modern, London; Whitney Museum of American Art, NY; Solomon R. Guggenheim Museum, NY; Walker Art Center, MN; Smithsonian American Art Museum, Washington D.C.; Brooklyn Museum, NY; Corcoran Gallery of Art, Washington, D.C.; Museum of Contemporary Art, Chicago, IL; Detroit Institute of Art, Detroit, MI; Indianapolis Museum of Art, Indianapolis, IN; Seattle Art Museum, Seattle, WA; Malmö Kunstmuseum, Sweden; and Sammlung Verbund, Vienna, among others. Gladys Barker Grauer was born in Cincinnati, Ohio and grew up in Chicago, Illinois. She was educated at the Art Institute of Chicago. In 1946 she moved to New York City where she met and married Solomon Grauer. In 1951, they moved to Newark’s South Ward where they raised their four children, and where Gladys still resides. Gladys is an arts educator. She taught Commercial Art in the Essex County School Vocational Schools from 1974 to 1988. She is a founding member of Black Woman in Visual Perspective, the New Jersey Chapter of the National Conference of Artists, and the Newark Arts Council. Gladys has also served on several Boards. For over 60 years, her artwork has been exhibited locally, nationally and internationally; and is in numerous private collections. Since 2006, she has completed five murals in Newark. Her most recent mural Music Unites Us All was installed on the PSE&G Fairmount Heights Art Wall. She has been included in numerous art publications including the St. James Guide to Black Artists, New York Art Review, Gumbo Ya- Ya: An Anthology of Contemporary African-American Women Artists and Defying the Odds: Triumphant Black Women of Newark and Newark Women, from Suffragettes to the State House. At 95 years young, Gladys Barker Grauer continues to inspire the next generation of artists, and through visual discord, express her social, political and personal views. Schor is the author of two books of collected essays, Wet: On Painting, Feminism, and Art Culture and A Decade of Negative Thinking: Essays on Art, Politics, and Daily Life. Schor is also co-editor of the journal M/E/A/N/I/N/G and editor of The Extreme of the Middle: Writings of Jack Tworkov. She is Associate Teaching Professor at Parsons Fine Arts. Schor was elected to the National Academy of Design in 2017. Schor is represented by Lyles & King Gallery in New York City. 2019 Honorees for the President’s Award for Art and Activism Aruna D'Souza writes about modern and contemporary art; intersectional feminisms and other forms of politics; and how museums shape our views of each other and the world. Her work appears regularly in 4Columns.org, where she is a member of the editorial advisory board and has been published as well in The Wall Street Journal, CNN.com, Art News, Garage, Bookforum, Momus, Art in America, and Art Practical, among other places. Her book, Whitewalling: Art, Race, and Protest in 3 Acts was published by Badlands Unlimited in May 2018. She currently editing two forthcoming volumes, Making It Modern: A Linda Nochlin Reader, which will be published by Thames & Hudson, and A Presence Which Signals Absence: Lorraine O'Grady Collected Writings 1977-2018.